If you live in USDA zone 7 or lower, the frosts and freezes of winter will quickly kill any geranium plant you have in your landscape, but you can safely save your favorite geraniums over the winter by bringing them inside. There are two ways to do this. One will put your geranium into dormancy, but if you have a bright sunny spot in your house, you can pot your geranium and let it continue to grow and bloom inside throughout the cold winter months. Dig up the geranium from your yard before the first killing frost. Once you dig the root system out of the ground, shake and brush as much of the soil as you can off the roots. Cut half of the upper plant growth off your geranium, using pruning shears. Place each trimmed, soil-free geranium into a separate paper bag or potato sack. Store your bagged geraniums in a cool basement, cellar or garage, as long as your storage space does not reach freezing temperatures. Check your dormant geraniums monthly for moisture content. 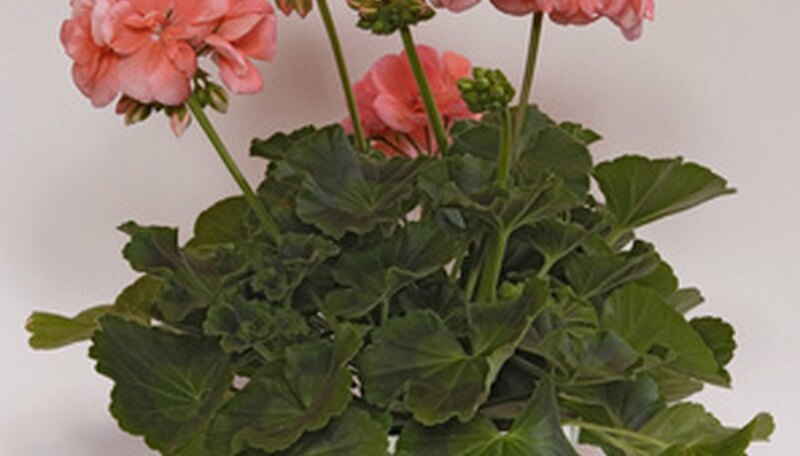 Humidity is essential for your dormant geraniums to survive over the winter. Too dry an environment will kill your dormant geraniums. If you see your geraniums have dried, soak them for two or three hours in a bucket or sink of water, then return them to their bags. Replant your stored, dormant geraniums in your landscape in the spring, after the last frost. Dig up your outdoor geraniums before the first hard frost. Prune off about half the growth before you move them indoors. Pot the geraniums in clean pots filled with potting soil. When you are potting your geraniums check the plant and leaves, both top and bottom, for insects. If insects are detected, treat the geranium with an appropriate insecticide to rid it of the pests before moving it indoors. Place your potted geranium in a location in your home that is bright and sunny, but not too warm. Over-wintered geraniums prefer temperatures that are in the 60- to 75-degree Fahrenheit range. Water your geraniums once a week, or when the surface soil becomes dry. Overwatering may cause your geranium stems to rot at the soil level. Move your potted geraniums outside in the spring, after the last frost. Keep them in pots, or replant them into your landscape for the summer. What Are the Optimum Growing Conditions for Geraniums?